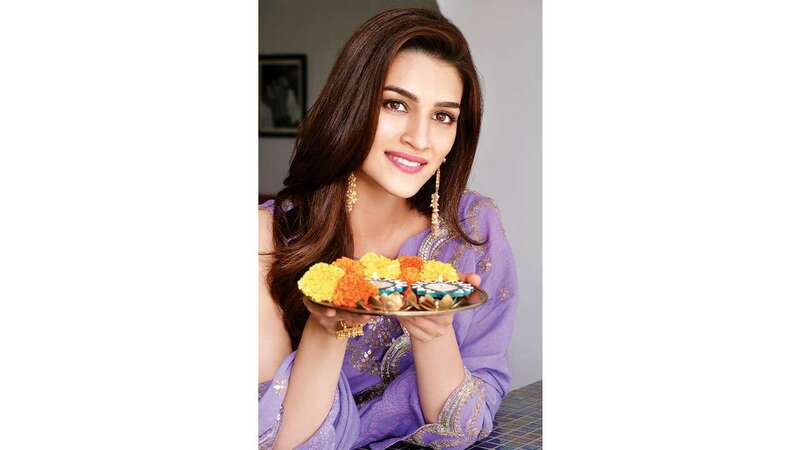 Nov 8 (AZINS) It’s the weekend just before Diwali when we arrive at Kriti Sanon’s Andheri residence. The leggy actress, who bought her home three years ago, has recently acquired the house opposite to hers, and converted it into a larger abode. While she has refurbished it, there are hardly any Diwali decorations in sight. “My parents have been asking me to put up some lights and decorate the house, but I’m so bad at all that!” she laughs. Her plush pad is replete with comfortable sofas, brightly-coloured cushions and knick-knacks that she has picked up from across the world. A number of photographs of her family members on the white walls lend her home a warm and cozy feel. But Kriti’s favourite corner is a colourful low sofa next to the large window, where she likes to sit and unwind. “Every day when I wake up, that’s where I like to enjoy my morning cup of tea or coffee. It’s my space to chill,” she tells us, adding that this is where she reads scripts and plays with her pet dog, Disco. The actress, who has wrapped up Luka Chuppi that also stars Kartik Aaryan and is currently shooting Housefull 4 with Akshay Kumar, is excited as this time, her parents have come to Mumbai for the festivities. “I had only one day off to celebrate Diwali, so it would have been impractical to go to Delhi. Also, we wanted to do the Laxmi puja in our new home,” she reveals. Kriti has fond memories of ringing in the festival of lights with her friends and family in the capital. With fairy lights and diyas lining the houses, Kriti and her sister, Nupur, would check out the neighbourhood areas to soak in the festive spirit. Her mother would make Chole Bhature for Diwali dinner, a tradition that continues even today. “When we were kids, my sister and I would make rangolis all day long. We would also play cards, which is another thing I’m bad at. My luck is so awful in this aspect that I even pass it on to the person sitting next to me!” she laughs. Luck might not favour her in cards, but the pretty star’s turn as Bitti Mishra in her last film, the delightful Bareilly Ki Barfi, has made her a sought-after artiste in Bollywood today. She has four films up for release in 2019 — Luka Chuppi, Housefull 4, Panipat and Arjun Patiala — and has been working non-stop this year for the same. All the more reasons for this Diwali to be more special? “Well, I think this time it’s more special as my family is here with me, celebrating in this new house,” says the actress. The revelry has a sweet touch as Kriti’s mother has brought her favourite Dilli ki mithaai. “Delhi sweets are to die for! I love chamcham, milkcake and kaju katli. My mom always brings them for me and my friends,” she says. Not Bareilly ki barfi, we can’t help but ask cheekily. “I had loads of it last year!” she laughs.